Rita Mariner, the owner and “Chieftess” of the Sunweaver Estates, has emerged as this year’s champion fundraiser among the Passionate Redneads. But this honor came at a price. Her coat of fur. Rita, the proud and confident leader of the Sunweavers, has been known to change her avie on occasion, but has always been known for her purple kani bunnygirl look. Following the success of two “Bid Me Human” events held by the Passionate Redheads, Rita volunteered for one of her own. If anyone would get a lot of attention from those among the Passionate Redheads also in the Sunweaver group, surely she would, and in the process raise a lot of Lindens. The two previous events of this kind had gone differently. The first resulted in the volunteer having to spend a month without his fox avie (a few events excepted). In the second, the three week period the vixen would have had to gone furless was suspended after a larger donation came in to keep her foxy. One thing was gone to make sure this event would be a bit different from both. There would be two kiosks for the event, one for those voting with their lindens to bid Rita human. The other would be for those donating to keep her a “purple bun-bun.” A minimum of 5,000 Lindens was needed to get her to change, both kiosks counting to the total, plus an additional day for every 1,000 raised. 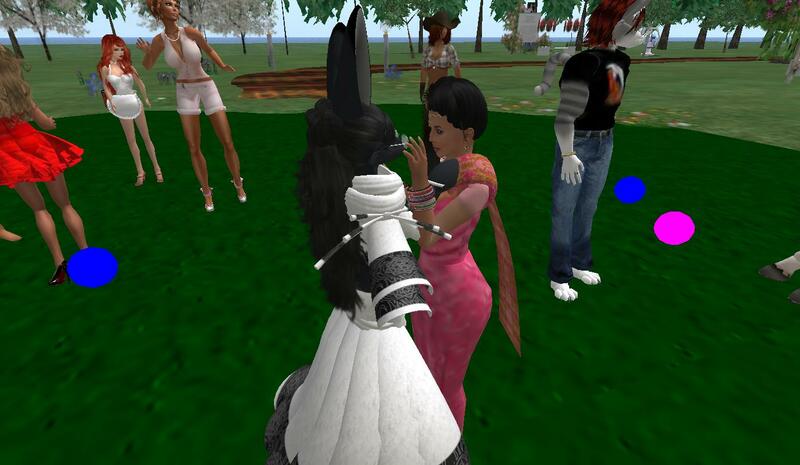 *But* the total on the “human” kiosk had to be at least one linden over the “furry” one. Otherwise the bunny would escape without as much as a moment as human. The event was set for Tuesday from 5 to 7 PM SL time. 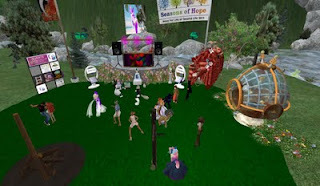 Join the Passionate Redheads Relay For Life of Second Life team for “Bid Rita Human ... or NOT!” Tue Jun 28, 2011 5-7 PM SLT Come party with the Redheads while the bidding war for Rita Mariner becoming human begins! 5000 L$ for a week, then 1000 L$ per day after, but only if the human kiosk wins! Which will it be? There was a little confusion about where the party would be, SL Newser mistakenly hearing it would be held as a special event at Club Cutlass. But instead like the first Redhead’s Bid Me Human it was held at Southern Colorado near Fimi Falls. And at 5 PM, the Redheads, from the Sunweaver lands and elsewhere, began gathering at Southern Colorado. Friends from other teams were also there, such as Fuzzball from Team Steelhead whom showed up in the enormous wig he had promised to wear if his team went Platinum, this time dyed red. 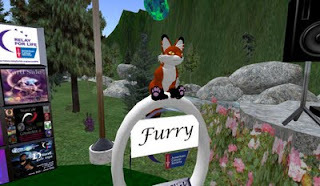 Besides the mix of human and furred avatars, there were a few of the “bronies,” plus one of the Sunweavers went feral fox for the night, musing he thought someone should represent the local wildlife. DJ Nydia Tungsten and Jenn Chant, normally foxy and feline respectively, went human for part of the event to symbolically "pass the torch," Nydia being the previous volunteer for a bid event. From the start, the Lindens were coming in. 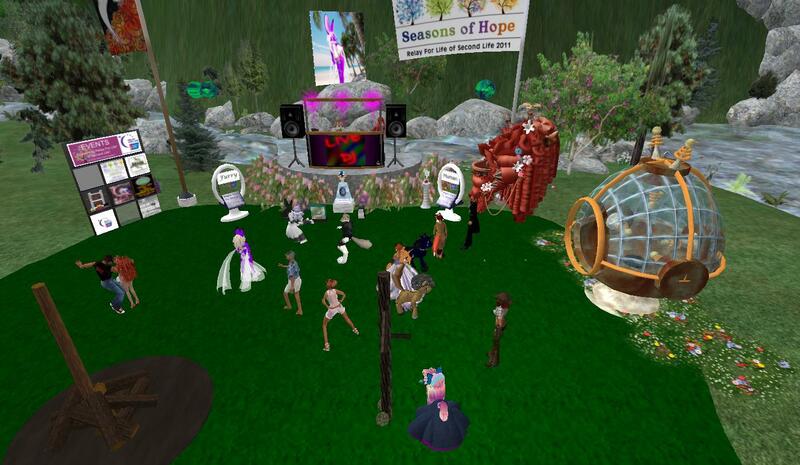 Unlike the event with DJ Nydia, the money to bid Rita human was coming in quite fast. The tough landlady wasn’t exactly drawing the same reluctance from those in furry avs to make her go tailless for a while, nor from the normal humans, “Skin her! Skin her!” The $5,000 was soon raised, and Rita was set to spend at least a week as human. But the purple bunny wasn’t going down without a fight. 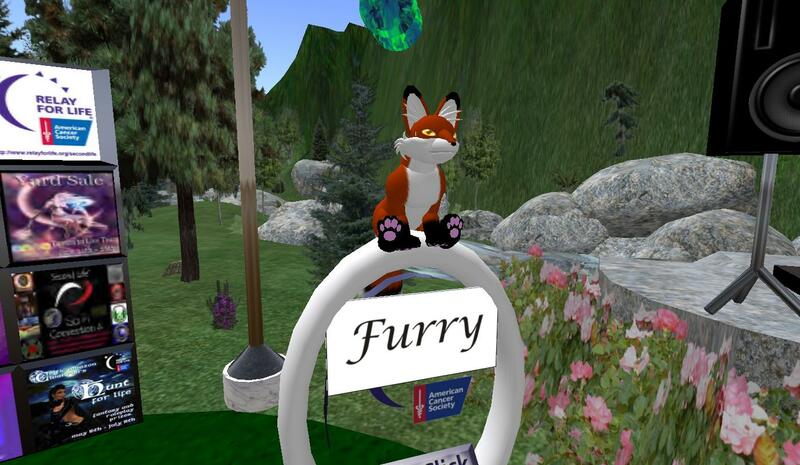 She added some cash to the furry kiosk, sending a message if the Relayers if they wanted a little fun at her expense, they’d have to fork over a lot more for it. And over time, the amount was slowly matched. It's close (21:09:49 )The bidding is hot and heavy to get Rita human. 26149L's for her to be human, 25153 for her to stay furry ( but she put in 25K in that one). So come help us keep the balance in human favor!! The party went on for a while with more coming in. Then with ten minutes to spare, Rita put in another six thousand Lindens. Unless almost 5,000 more was raised, her cottontail would get away. So the Redheads and friends reached a little deeper in their pockets. But with one minute to go, they were still 1,000 short. Last-minutes amounts came in from tens of Lindens to a few hundred came in, and at the last second the human kiosk won. And It's HUMAN! Well, looks like the Sunweavers will be having a human Chieftess for a while. The results are in, 36903 vs 37909. It's Human by a nose. A final total of 74812, which is 76 days as human for Rita. Let's hope she has plenty of sunscreen for those days at the beach. Thanks again for your willingness to take one for the team Rita, or in this case take seventy-six, and Go Redheads! The total in US dollars raised was impressive as well, Team Captain Sabine McGettigan announcing, of the total raised this year, “$2199 is what we have raised so far! That's REAL MONEY! Can you believe it? It’s like ... a CAR!” Daaneth Kivioq soon had an announcement of his own, “Actually - its 2500 USD now by the website.” It was also announced that since the founding of the Passionate Redheads team, they had raised a total of $30,500 US dollars. Already the team was looking forward to further events. Lomgren Smalls announced his new RFL microkitty would soon be available for purchase, in male and female versions. And of course in Sabine’s words, “Less than three weeks to Relay!” The Walk would be soon. For those of you wishing to meet Rita Mariner to give her a few words of thanks, she frequently appears at Club Cutlass on Wednesdays, Fridays, and Saturdays 6 to 8 PM. Thank you Bixyl, for the lovely write-up. This event was especially moving for me personally. Seeing my teammates working so diligently in order to raise money for Relay for Life...now that's PASSION! You're welcome Sabine, and it turned out to be a great Relay season.